The Ametek CTC series is a fast dry-block that offers both interchangeable inserts, the MVI stability circuitry, and calibration software. Both speed and portability are superior to liquid baths. 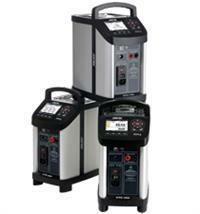 Dry-block calibrators do not require hazardous liquids and provide a wide temperature range. Calibrate RTD's, thermocouples, thermoswitches, thermistors, and other common temperature sensing devices. The CTC series is designed for both on-site and maintenance shop use. The applications are generally critical process control but can vary based on calibration and testing requirements. The user interface is easy and intuitive. One-key-one-function gives you quick access to timesaving features such as the switch test or the auto-stepping function. All models feature a large, backlit LCD display panel, which is easy-to-read even in well lit areas. Units feature an informative display that provides icons and information regarding the status of the CTC and the calibration in-progress. The JOFRA CTC series consists of six different models that differ in temperature ranges and immersion depths. All units offer similar features. A rugged, slim-line, aluminum outer casing with die-cast top and bottom protects the CTC series of dry-block calibrators. For easy documentation and automatic calibration, all units are delivered with RS232 serial communication and JOFRACAL calibration software. JofraCal calibration software ensures easy calibration of RTD´s, thermocouples, transmitters, thermo switches, pressure gauges and pressure switches. It may be used with our well-known temperature calibrators as well as with pressure and multifunction calibrators. JofraCal calibration software provides an entirely automatic calibration of sensors and a semi-automatic calibration of the complete process loop by means of a PC. The software handles the comparison between the process readout value and the reference value, controls the complete calibration procedure, stores the results, and provides a calibration audit trail through hard-copy certificates. All calibration data are stored for each sensor to monitor drift and optimize recalibration intervals. A scheduler feature allows planning of future calibrations.